CocoaBurn Thermogenic Fat Burner Review: It’s Ridiculous! Home » Fat Burner Reviews » CocoaBurn Thermogenic Fat Burner Review: It’s Ridiculous! 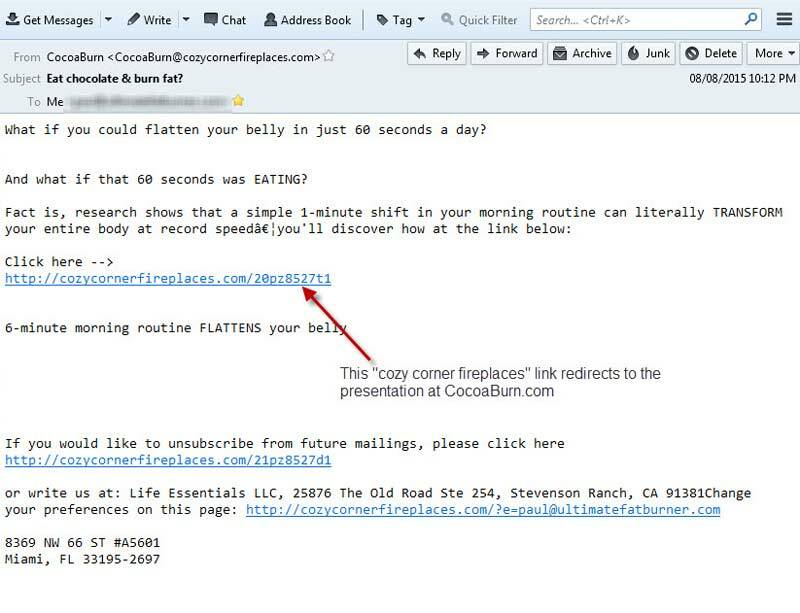 CocoaBurn Thermogenic Fat Burner Review: Stop Spamming Me! I received these daily for ages! … so I thought I’d give in and take a look at the product. You know, to do a CocoaBurn review. I shudda just hit the “delete” button one more time. 7 ridiculous, totally unsubstantiated or just plain WRONG CocoaBurn claims. The bottom line. It ain’t pretty. Completing this CocoaBurn review was a pretty tiresome affair. Yeah, this is how I felt. YOU try watching it! 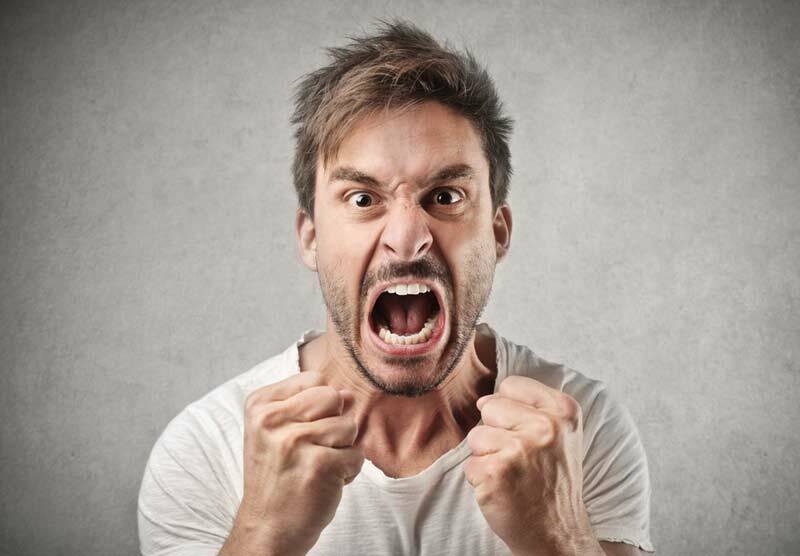 Not only did I have to sit and grit my teeth through a tedious 20-something minute video sales letter to finally get a look at the product, but the presentation itself was a tangled web of of unsubstantiated claims, half-truths, outright nonsense, and a somewhat relevant discussion on the dangers of elevated insulin levels. And to top it all off, CocoaBurn is allegedly endorsed by a “world-renown” doctor, Dr. Steve Klayman (I didn’t see anything on his web site about CocoaBurn so who knows?). Ok, so he’s not actually a medical doctor as implied (he’s a chiropractor), he doesn’t appear to specialize in weight loss, and from I can tell he’s relatively unknown outside of Austin, Texas, where he operates, but who cares? When you’re piling it this “high” and this “deep”, “world renown” is a small detail at best. Take this and lose twice as much weight as running 20 miles per week! Men taking the ingredients in CocaBurn and following a basic diet reduced bellyfat by 14%. Chromium is essential for increasing muscle mass. Chromium “sparks” your metabolism, helping you burn fat, even as you sleep. Men taking the ingredients in CocoaBurn lost 34 pounds and women lost 26 pounds over the course of the trial. Not one of them is supported by a single clinical reference. In other words, the retailers don’t reveal which studies support the statements they make. I personally, don’t know of any that would justify claims of this nature… especially given the relatively ordinary nature of the product formula. And, since they’re the ones making the claims, the burden of proof rests with them, not me. Some statements, like chromium’s effect on increasing muscle mass is completely contradicted by the existing clinical evidence – it does nothing of the sort. This has been confirmed in multiple studies. And as far as chromium’s effect on weight loss? In “non-politically correct” speak, the studies showed a small effect, but they appeared to have methodological flaws which called the authenticity of the results into questions. The results have not duplicated in follow up studies. The weight loss between placebo group and non placebo group was the same. The chromium group lost slightly more fat mass than the placebo group. For a more detailed discussion on chromium’s role in weight loss abnd blood sugar management, our full chromium review is here!. At this point, you’d be correct in assuming things are starting to get pretty gosh-darned silly. But I’ve found that 99 times out of 100, if a series of seamingly ridiculous statments are made about a product, there’s usually a germ of truth lurking in the background. Theobromine (a constituent of cocoa which is included in CocoaBurn) can lower blood pressure by dilating blood vessels. This has been demonstrated in human clinical studies. Of course, CocoaBurn won’t reduce your blood pressure regardless of the retailers say, because it doesn’t contain anywhere near the dosage of theobromine necessary to elicit results similar to those obtained in the study. Same goes for the “asthma benefit”. Theobromine can relax bronchi muscles in the lungs, which suggests it may have an anti-asthmatic effect. At this point, however, this benefit has only been demonstrated in animal studies, may or may not be applicable to humans, and certainly not at the dosage included here. After enduring the 20-something minute video of near-continuous bullsh*t, I learned that CocoaScam CocoaBurn contains chromium, green tea, cocoa powder and brown seaweed, but I had to go digging for the dosage information, because that wasn’t provided anywhere. Chromium polynicotinate (330 mcg): As I’ve already discussed, the science supporting its weight loss effects is pretty weak. Chromium isn’t without value – it is helpful for balancing blood sugar and controlling cravings, but it’s effects on weight loss are minor at best. See our full review here! Green tea extract (320 mg, 30% polyphenols): I like green tea – properly standardized extracts, combined with caffeine, can elevate the metabolism. However, as documented in my article, “How much weight can I lose with green tea“, it’s no “10lbs in 30 days” solution to weight loss. It’s effects are, not surprisingly, subtle. Cocoa Powder (237 mg): From what I can tell the cocoa powder in this formula isn’t standardized for Theobromine. Not that theobromine has any demonstrated weight loss effects or anything, but it is the ingredient to which many of the more general benefits I outlined earlier can be attributed. Oh well. Brown seaweed (Fucoxanthin 5% 125 mg): Despite the claims, fucoxanthin’s weight loss effects are only supported by animal studies – not human ones. And, to make matters worse, human studies show it’s very poorly absorbed. This ingredient is a dud, a least until clinical data shows otherwise. More on fucoxanthin here! The CocoaBurn formula is not without value. Chromium polynicotinate is probably the best version of chromium to experiment with right now, and it can be effective for eliminating cravings. Weight loss however, not so much. Properly standardized green tea can be helpful too, although it would be more so if it were combined with caffeine, as it was in this positive clinical study. Price: 69.99 is about 2-3 times what this formula is worth. Outrageous. Claims: The promotional video for this product contains a ton of unsubstantiated nonsense. If these guys are looking to attract attention from the F.T.C., this is the way to do it. Spam: Until I set up my filters, I was getting spam for this product daily. Spamming is illegal. I checked my filtered email recently and the CocoaBurn spam seems to have dribbled off, so perhaps the retailers have acted against an over zealous affiliate, or perhaps they were doing this themselves and the backlash was too high. Who knows? Lack of citations: Not a single clinical reference is provided to support ANY of the statements made by the retailers. Like it or not, the burden of proof is on the retailers – the makers of CocoaBurn. And they haven’t provided any. YOU should respond by not handing them your money. As a PH.D., I don’t believe much of anything unless I can substantiate it. The claims that were made on the sales video were totally off the wall and unable to be verified. Thank you for taking the time to show the readers this important aspect of verifying claims. Most people however will take them ‘at their word’ and get scammed. Thanks for your thanks and your comment, James! You`re very welcome. Glad we could help! Hi I am Karl and I use it also for a month and no weigthloss anything we can do? Certainly a refreshing change from the “Don’t buy [nostrum] until you read this!” pages that actually tout an alternative product while posing as an impartial report from a spurious Consumer Research organization. Thank you, Ultimate Fat Burner. You validates my initial reaction to the CocoaBurn Video: 1) If this product is so great, why didn’t I learn of it through credible channels, and 2) If its too good to be true, it probably isn’t! As an ex MMA fighter, over 60 bodybuilder and chiropractor, I know a few things about dieting and weight loss. Thank you Paul for your expose’. I couldn’t have said it better. You would need to take 20 pills a day minimum to actually get some benefits from their meager ingredients. You’re welcome Dr. Gary! Appreciate your comments and the kudos! Cheers! Ihave no pills left can ibuy it in Nz could be cheaper her? Not sure why you’d want to Karl.